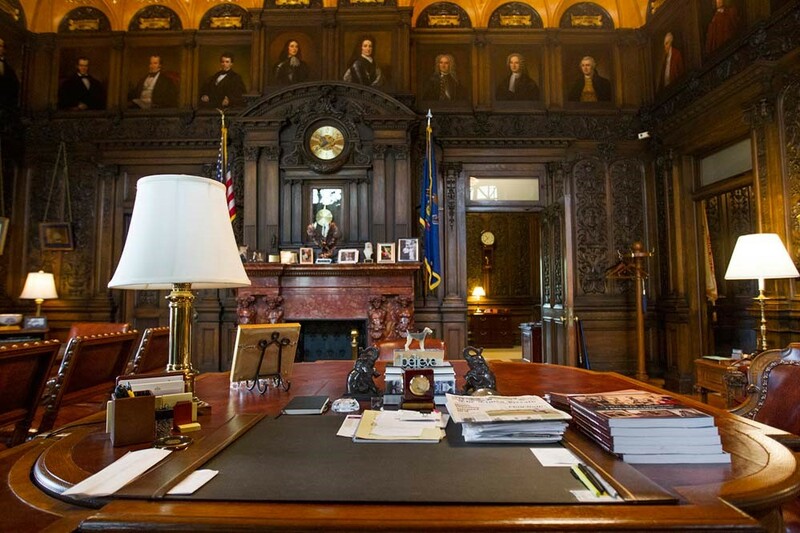 Image of the Pennsylvania Governor’s Office at the State Capitol in Harrisburg. The clock seen above the fireplace extends from the carved and arched hardwood top to just above the stone mantel, approximately 4 feet in total from dial and mechanism to the lower end of the pendulum bob. Image courtesy of www.pennlive.com. I have always been fascinated with clocks. If you were to see me in a museum or auction gallery—whether on one of our field studies with my Winterthur classmates or on my own—chances are that you would find me by the clocks. While my time at Winterthur so far has allowed me to study clocks from a historical perspective, I realized that I really did not understand how they worked: how do different movements work differently in similarly-sized cases? How does one assess a clock movement, understanding the best way to repair or restore it to working order without altering its historical significance? Thanks to a WUDPAC lecture this past February, I found an opportunity to answer some of these practical questions. 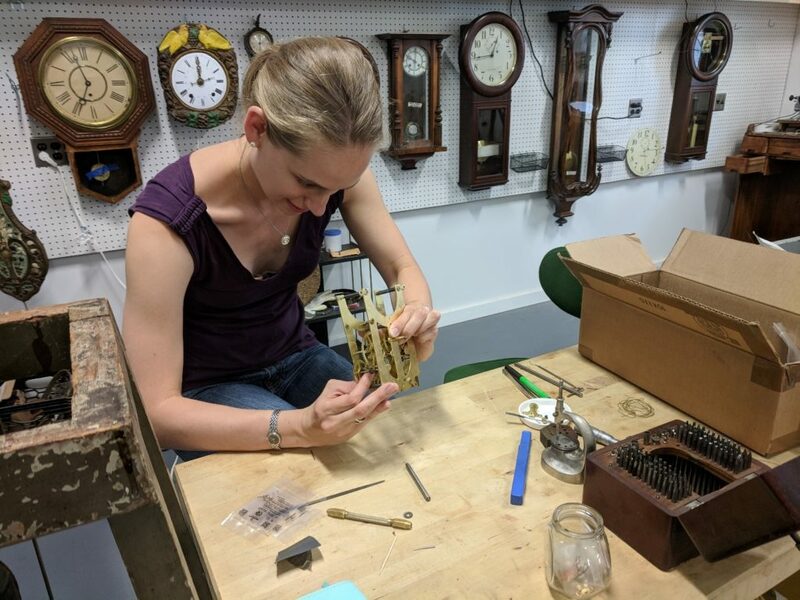 I interned with Lili von Baeyer, clockmaker and historic clock repairwoman, in her Philadelphia studio this summer. Through my work with Lili, I was able to better understand the practical side of working with clocks, seeing not just beauty in their historical significance and patina but understanding their functional needs and learning ways to weave together practicality and beauty. One of Lili’s long-term clients is the Pennsylvania State Capitol. Lili is responsible for cleaning and repairing all of the Capitol’s 208 wall, shelf, and mantle clocks, and I accompanied her on one of her twice-monthly trips to Harrisburg. All of these clocks in every office are expected to keep accurate time 24/7. The state employs several people (called winders) to wind these clocks on a weekly basis, but if the movements stop ticking, Lili is responsible for repairing them—no easy feat. I was particularly surprised by the mantle clocks: not your typical cased clock which sits on a shelf, these clocks are literally built into the space over certain offices’ mantlepieces, with three- to four-foot-long pendulums and weight-cords, sturdily encased behind heavy, carved mahogany and oak and brushed brass dials. Lili often relies on the curatorial team at the Capitol when these clocks need to be removed, as it can be a two-person job to lower the weights, remove the dial, and finally extract the movement from its chamber. However, these clocks are all located in active offices and as such must continue to function even if their movements are at Lili’s studio. To comply with this requirement, Lili places a battery-powered quartz movement behind each dial so the clock will continue to appear functional even though its movement is gone. Hardly any of these clocks would be considered antique or valuable in the museum sense, but they are a vital component to daily life and work at the Capitol and a large responsibility to maintain—both in the number of work hours and their significance to Pennsylvania politics. Assisting Lili with client work allowed me to gain a unique understanding of her day-to-day job but my main project throughout my internship was perhaps the most significant to my understanding of clocks as material culture. On my first day with Lili, she handed me an Ansonia 5 ½ shelf clock to assess, clean, and repair. I quickly realized how little I knew about the ways clocks truly function and that bringing them back to working order after years of disrepair is a true feat. I sketched the gears on both the time and strike side of the clock, carefully disassembled the front and back plates from gears and springs, and cleaned the clock in a solution with electrical charge to gently remove any old oil, dirt, and corrosion. When Lili works on a clock like this one, she will typically take it apart and put it back together between two and eight times; I think I did this at least 20 times. A deceptively simple instrument, this Ansonia 5 ½ pushed me to think about the amalgam of interlocking components, making sure the delicate posts and pins were straight, punching the correctly-sized holes for new bushings, and ensuring everything was reassembled to prevent friction. My Ansonia partly assembled to check for alignment of gears, pins, springs, etc. This was after I had cleaned and examined it for any bent or broken teeth (thankfully none), straightened out posts and pins that had bent, and re-done bushing holes so the pins would sit evenly in the front and back plates. Here you see a close-up of the strike side of the movement with its spring, gears, and flywheel in the lower right. Image courtesy of the author. 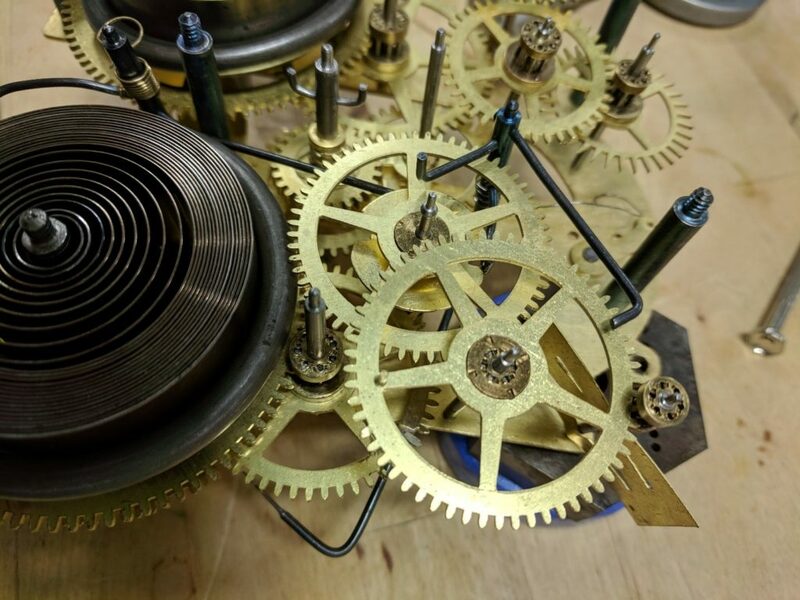 This project also included a trip to Merritt’s, a clock and watch shop and supply store, where I purchased the bushings, pendulum spring, pendulum bob, key, and hands necessary to have my clock working in full order again. I was pleasantly surprised to find how affordable many of these parts were, especially since I had to purchase multiples of a few of them—inserting the new bushings and cutting and shaping the new pendulum spring took a few tries! Working on this Ansonia gave me the exact experience I hoped to have during my internship: I was able to comprehend a particular clock from both a historic and practical perspective. Here the author is adjusting the assembly of the clock components between front and back plates—a tricky thing to do! Each time one pin fits into its place another one seems to slip, which necessitates a process of carefully adjusting gears and posts until everything fits together before clamping it to test their fit. This was just after finishing redoing the bushings, the punch set for which can be seen opposite me on the bench. Image courtesy of the author. Secured with clamps on my desk, this clock currently has no case. Someday I hope to make one, but for now I am happy to see my “deconstructed clock” on its own, ticking away the minutes since I was able to repair it and until I find the right house for it. This entry was posted in Academic Programs, American Culture Studies, antiques, Uncategorized and tagged antiques, Winterthur Museum Garden & Library, Winterthur Program in American Material Culture. Bookmark the permalink.